Kaeser Compressors is one of the world’s leading makers of air systems and equipment. It has had a physical presence the American market since the mid-1980s. The company competes against several very strong domestic manufacturers in the United States. 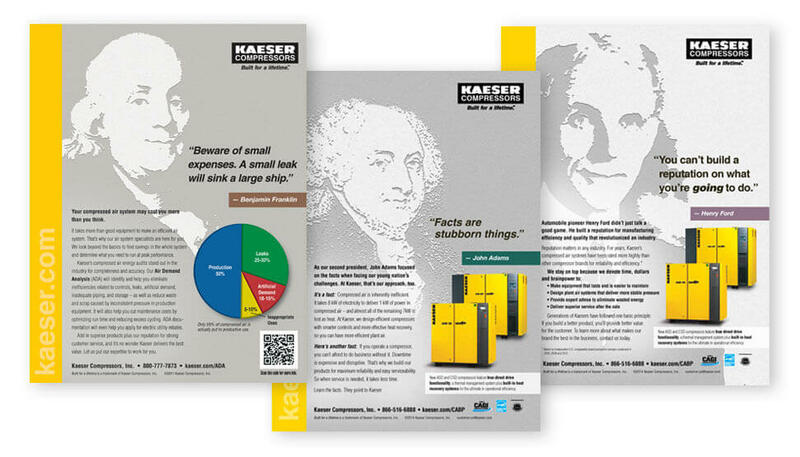 Removing the erroneous “foreign-sourced” factor from the equation, our advertising campaign uses images and quotations from famous Americans to symbolize the effectiveness, durability and energy efficiency of a variety of Kaeser industrial products including air compressors, blowers and control systems. The personalities and quotations highlighted in the print marketing campaign are inventor Benjamin Franklin, photography pioneer George Eastman, and presidential leaders John Adams and Harry S. Truman. The advertising provides an eye-catching, wholly different visual perspective from the typical product advertising that runs in B2B print publications. The result: more reader engagement and better memorability/retention rates.